What is a blue poulet? The Blue Poulet (or Blue Foot Chicken) was an American/Canadian chicken bred to closely resemble the famous French Poulet de Bresse chicken in appearance and flavor. As of 2012, it is no longer being produced. 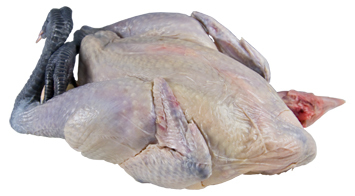 Poulet de Bresse has long been regarded as the finest chicken available in France. Unfortunately demand in France is such that we almost never see Bresse chickens in the United States, which made this domestic version very desirable. What made these chickens special (besides their blue feet, white feathers, and red comb (the colors of the French flag)) was their complex, slightly gamey flavor which posesses significantly more depth than conventional chickens. Chickens of this quality shouldn’t really be used in complicated dishes with strong flavored sauces (though they are sometimes paired with truffles). Instead they should be prepared simply (traditionally roasted whole) so that their flavor can be appreciated. Blue foot chickens were sold as Poulets de Bresse are traditionally sold: with the head and blue feet on. The blue feet are a sign of an authentic blue foot and are often left on when roasting whole so the restaurant patron knows what they are being served.